Hi,during the summer a large pot full of L.diffusa in my collection started sprouting white fungi. (plants are resonably "hard grown" and conditions are not conducive to harmfull fungal growth).Around the same time one of the plants began to speed up it's grouth rate and still appeares to be very healthy.Might this be a miycorrizal relationship? I have photos if your interested!PS. love your site! That's very interesting, and I would appreciate seeing your photos and hearing more about this. You can share the photos in the files section of the Lophophora Google group or drop me a mail at "lophophora [dot] blog [at] gmail [dot] com" (address "encrypted" to reduce spam). I don't know much about mycorrhizal relationships, but according to Park S. Nobel's Cacti - Biology and uses mycorrhizal associations occur in the root systems of a number of cacti. It would be an interesting experiment to grow two batches of seedlings under the same conditions, except that one batch should be inoculated with your fungus. 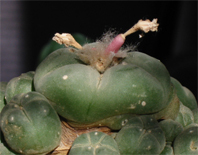 who ships legitimate lophophora williamsii seeds to the united states? Well, the short answer to that question is "nobody" ;-) To the best of my knowledge you can't legally possess peyote / Lophophora williamsii in the US, including the seeds, unless you hold the required DEA permits or is a member of the Native American Church. Am pleased to read your work and contribution in this area. My father did peyote research with Omer Stewart during the 70's and 80's. 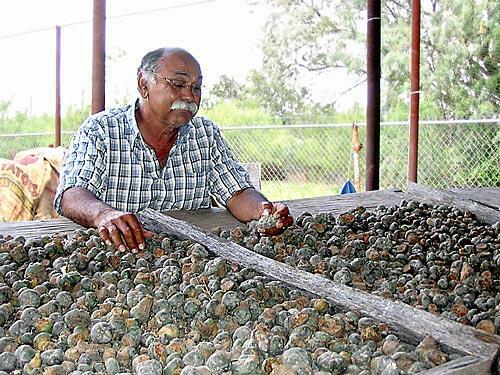 He was sometimes ridiculed when predicting peyote shortages as the tribes would say that it was "Gods' will that it is there." Keep up the research.